What came out very clearly as we read through the whole book was that the verse actually comes in the context of a searing indictment of the sin of God’s people. 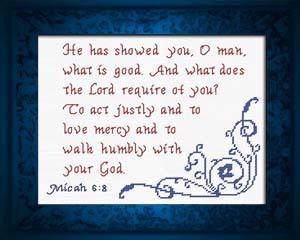 Micah 6 is a bit like 1 Corinthians 13 (the famous wedding passage on love). Just as the point for the Corinthians is that they haven’t got love in their church so Micah exposes how God’s people haven’t been doing justice, loving mercy or walking humbly with their God. They know full well what He requires (Micah 6:8a – this isn’t new stuff; it isn’t a lack of knowledge problem), what’s more they know God’s massive grace and love (Micah 6:1-5), and yet they are completely corrupt, violent and running after other gods. When God turns up in person a few hundred years later it’s no different – even the disciples fail to walk humbly with their God (Mark 9:33-34) – and mortal man, who knows full well what is good (Mark 12:32-33), pours out his corruption, violence and pride on God himself (Mark 14:10-11). Are our hearts different? Mine isn’t. That is our hope. Not our justice or mercy or humility. Jesus. The perfectly just, delighting-to-show-mercy, humble-to-the-cross one who takes away our sin once and for all. Isn’t that what we want to be preaching? That’s where the good news and life transforming power is.